Image Size 2.5 x 2.5 x 2.5 in. Kelly Wallace (C.1968 -) is a drawer that employs vintage lead on paper. Using vertical line drawn in cadence Wallace draws architectural -esque shapes arranged in a fluid wave form. The waveforms represent the levity that is possible when rendering a heavy subject, medium where mass is used to describe light. Wallace has a BFA from the University of Guelph and is represented by Georgia Scherman Projects in Toronto and The Seraphin Gallery in Philadelphia. Wallace’s drawing “ Medium Rare” was recently included in “ Drawing the Beginning of Everything” at Albright Knox in Buffalo. He has been awarded several grants by the Canada Council, Ontario Arts Council and is in collections at Museum London, Albright Knox, Art Gallery of Hamilton, Rodman Hall and the Judith and Norman Alix Art Gallery. Wallace lives in London Ontario with his family. Prototype – Out of Square no.2, 2017 is my second protoype or test box. I have made several variants of this shape – a cube that has a 15 degree tilt. 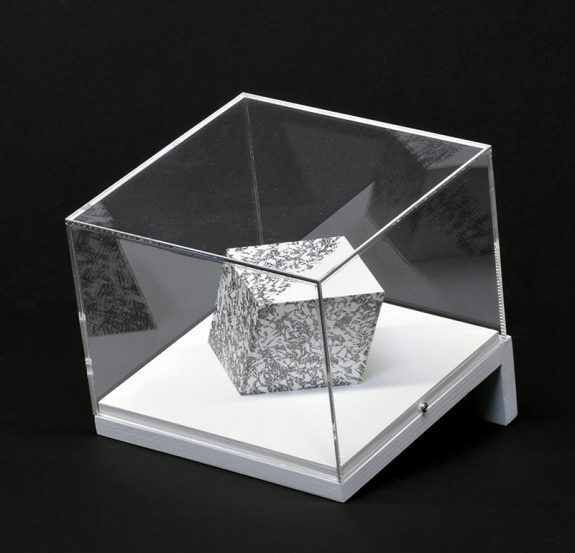 There is a rare earth magnet installed inside to keep the box secure while drawing and being exhibited. The polygon is the core shape in all my works. Drawing on a three dimensional surface where no part is level or square to earth, challenges my ability to make marks in three dimensional space. These prototypes were not created for exhibition – they are for me – rarely does my practice afford me the time to explore new modes.